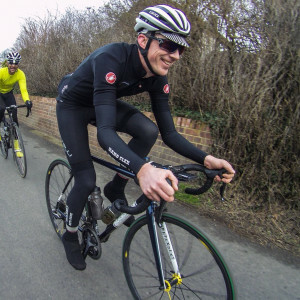 Tim has chosen to raise funds for Club Peloton and is taking part in Legal & General Real Assets Cycle to MIPIM 2019. "Donation on behalf of Mary Bowman at Gustafson Porter + Bowman "
"Well in Tim! Great effort! " "Just picked this up on Insta mate. Must live in a bubble.... Great effort"
"Good luck Tim! Just focus on that beer on arrival. " "Good luck Tim, nearly there!" "Great effort so far Tim!" "Great stuff and well done! Look after the knee!! M & D"
"Smash it Tim. Would love to be riding with you!" "Watch out for the Lorries!" "May the wind be behind you, have a great ride Richard and Tim, from all at Izit." "Good Luck Tim! I'm sure you can Handle-bar it, and won't get tired. Just get pumped up." "look after those knees Tim... and watch for chaffing!" "Only another 2930 to go!" "Good luck Tim - Keep on rolling! See you in Cannes"